This memorable combination of dark chocolate, orange and raspberry is perfect for the fanciest of dinner parties. It’s also easy to prepare and can be made ahead. Prepare 8Â½” X 4Â½” loaf pan by lining bottom and long sides with a double layer of wax paper which extends over each edge of pan. Set aside. In a small heavy saucepan over medium-low heat, bring the milk to simmering. Add the bittersweet chocolate and stir occasionally until chocolate is melted, and mixture is smooth. Add sugar, butter and cocoa, and stir until completely dissolved. Do not allow this mixture to boil. When mixture is smooth, add orange flavoring and set aside to cool. In a small heat proof cup, sprinkle the gelatin over 3 tablespoons of cold water and allow mixture to soften for 2-3 minutes. Microwave on high for 20 seconds and allow to stand for 2 minutes or until granules are completely dissolved. Blend into chocolate mixture and set aside. Beat the heavy cream in a chilled bowl with chilled beaters until nearly stiff and peaks hold their shape. Cool chocolate mixture to room temperature and fold in whipped cream. Pour into loaf pan and freeze 6 hours or overnight. Process undrained berries and orange juice in processor or blender until smooth. Strain. In a small saucepan, blend sugar, cornstarch and strained berries. Place over medium heat and bring to a simmer, stirring frequently. Reduce heat and continue stirring until sauce thickens. Remove from heat and allow to cool. Makes about 3 cups. Remove from freezer approximately 20 minutes before serving time. 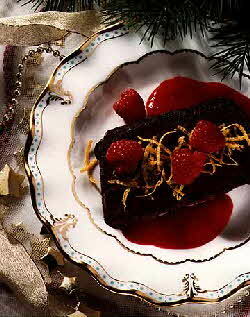 Place 2-3 tablespoons raspberry sauce on each dessert plate. Slice with a clean knife dipped in warm water and place a slice on each plate. Garnish with thin slices of orange zest, and partially frozen whole frozen raspberries. Pass any extra raspberry sauce around the table.